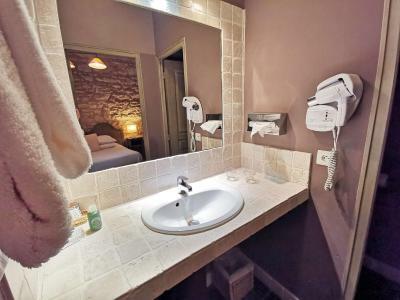 Lock in a great price for Hôtel Sous les Figuiers – rated 9.1 by recent guests! Great location just a block away from the center, with all the restaurants and shopping. Quiet and peaceful, the garden with the huge fig trees was beautiful, with pathways, fountains and seating areas. Our room was large, simply furnished, quite comfortable. We enjoyed the terrace, shaded by the fig trees, it was the perfect place for a glass of cold rose on a hot afternoon, Pierre graciously provided ice and wine glasses. We enjoyed the breakfasts, beautifully presented local products and home made tarts. Pierre and Armelle are charming, welcoming hosts. Very good location, breakfast was memorable with home made cakes and breads. The garden was an attractive place to sit but may want mosquito repellant. Would return to this lodging. The owners were incredibly friendly, and offered great recommendations on what to see and do in the area. The hotel is nicely situated just outside of the city center, and is a very easy walk to the historic van Gogh trail and Roman ruins about a mile down the road--both of which were great to see! The room was very cute and cozy, and the breakfast buffet was full of phenomenal local foods, as well as smoothies and juices made from fresh fruits in house. Would recommend and will definitely visit again! Lovely hotel setting literally under beautiful old fig trees. Excellent breakfasts -- all organic, local products, highlighted by homemade fig tart! The couple who own the hotel are helpful and generous in every way. Merci mille fois!! New owners Pierre and Armelle were wonderful hosts and provided us an upgraded room at no additional costs. Pierre met us at our car to help us with our bags and provided a walking map and recommendations for the best restaurants in Saint-Remy. Pierre's breakfast was superb, including perfectly boiled eggs. 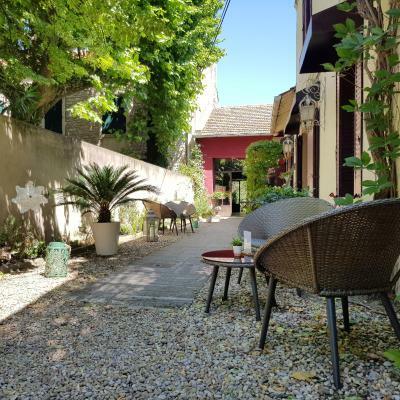 The property is gorgeous - cute rooms with well equipped porches facing either a courtyard full of amazing old fig trees or the walkway from the front of the property. The bed was comfortable and air conditioning worked well. Great, large shower and bathroom in the room we were in. Room was very clean, hosts were very friendly and communicative. Location is great, walking distance to the center of town. I stayed at the Hotel Sous Les Figuiers for 7 nights while exploring Provence. The Hotel is one block off the main street of Saint Remy in a quiet tree-lined setting with secure parking. Saint Remy is centrally located enabling the traveler to visit other Provence towns each day. Saint Remy has numerous restaurants on the main street. I could come back after each day, park my car & walk one block to have dinner. "Kups", the hotel owner & her associate Katrien made my stay a wonderful welcoming experience. Each day they gave me helpful suggestions and strived to ensure my visit was a great experience. My room & bed were very comfortable with an outdoor sitting area to enjoy the garden. Each night was like coming home. This was my sixth trip to France & one of the best trips of all. Merci beaucoup Kups & Katrien! Highly recommend! 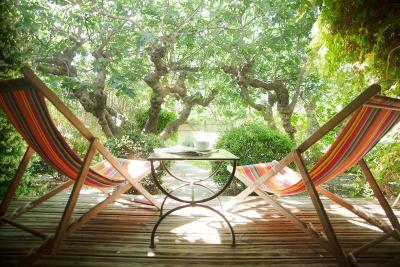 Beautiful fragrant garden with fig trees. Kind and accommodating staff. Nice drinks and breakfast. Chic rooms. Comfortable bed. Great location. Reasonable price. The owner was delightfully friendly and accommodating. 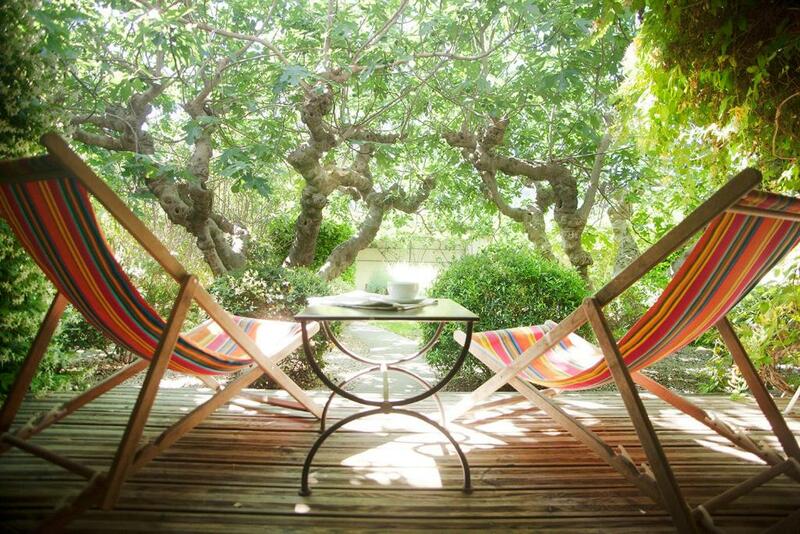 Featuring a garden that is planted with 100-year-old fig trees, this air-conditioned hotel is located in Saint-Rémy-de-Provence. Free WiFi is provided throughout the property. The traditional-style rooms feature wooden furnishings. Some of the rooms offer a garden view or a private terrace. A hairdryer is provided in the bathrooms. You can enjoy a Provençal buffet breakfast with local produce in the dining room or on the terrace at Hôtel Sous les Figuiers. You can also enjoy a drink in the bar. Private parking is free on site and Servanes Golf Club is a 25-minute drive away. You can visit Avignon, which is 9.9 mi from the hotel. This is our guests' favorite part of Saint-Rémy-de-Provence, according to independent reviews. 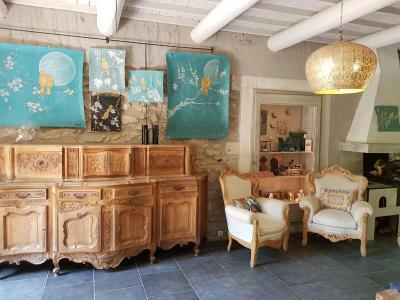 This property also has one of the top-rated locations in Saint-Rémy-de-Provence! Guests are happier about it compared to other properties in the area. When would you like to stay at Hôtel Sous les Figuiers? This room is air-conditioned and has a private bathroom. This room is air-conditioned and has a private bathroom. The room features a private terrace or a private courtyard. This room is air-conditioned and has a private bathroom.The private terrace offers a view of the garden. Please note that this room can accommodate an extra bed for an extra charge of EUR 22 per night. This room is air-conditioned. It has a private bathroom and a private garden area. House Rules Hôtel Sous les Figuiers takes special requests – add in the next step! Hôtel Sous les Figuiers accepts these cards and reserves the right to temporarily hold an amount prior to arrival. If you plan on arriving after 20:00, please contact the property in advance to obtain the necessary access codes. Contact details can be found on the booking confirmation. The facilities are a little funky, but OK. It's not a 4-star hotel, but you aren't paying for a 4-star hotel either, so it was fine. Quiet hotel in a perfect location. It's a short walk to the center of the town, and close to a wonderful archeological site. The owners were very nice. They offered great suggestions for restaurants. The food and wine in St Remy is fabulous!! Although other rooms looked much better on pictures, ours was way too small with way too short bed. Certainly not suitable for two people. Room had humid odor, with mold on bathroom tiles and some places in the room. Nice bohemian hipster style hotel with vintage look and feel. Very close to centre. Friendly owner, decent variety of choice for breakfast (at surcharge). Shower is not a stand up shower and pressure in hose is not that strong. It’s designed for taking a bath then lightly rinsing yourself off with the handle. For Americans this may prove strange but I took a BATH and rinsed off with the hand held shower head and loved my experience. Also in October there are mosquitos and moths that fly in if you leave windows and doors open so don’t do that. We had to leave after only one day in order to return home. Nothing not to like. The whole experience exceeded our expectations. Pierre and Armelle were very cordial and helpful. The location near centre, the lovely figs trees providing a lovely canopy, well decorated and clean rooms, excellent shower, AC worked well. Parking was very convenient. And the breakfast was excellent value. All was tasty but especially the lovely cheeses. Would love the opportunity to return at some point. The bed was not very comfortable, and the shower was a bit temperamental when it came to temperature and water pressure. Otherwise, it was very well-appointed with no issues. The room was small dark depressing and smelt musty. A beautiful, spacious room with a lovely bathroom and fabulous terrace - felt like a studio apartment. Great pool for a city centre place. Lovely staff. Our room was a little dark because of the trees in the garden, however we could live with it, maybe also added to the intimacy. Nice looking hotel with a huge garden of trees. It is just a few minutes walk away from the historical town center. Armelle and Pierre did an extraordinary job to please us and they also speak very good English in case you don't speak French. Breakfast is nice and has a huge selection of local goods. They also pay attention to support local companies.